The wait is finally over for Prozak fans. 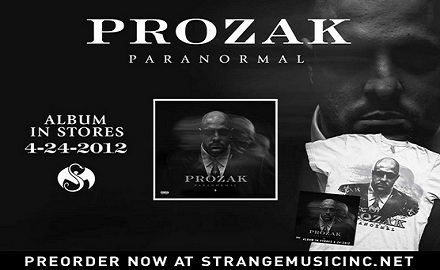 Four years after the release of Tales From The Sick, Prozak strikes back with his latest Strange Music album, Paranormal. The brand new release marks a new chapter for Prozak and will offer fans a new take on the world around them. With thought provoking tracks like “Million Miles Away”, Prozak seeks to explore the reality of today’s struggles in society. Featuring appearances from the likes of Tech N9ne, Krizz Kaliko, Danny Boone of Rehab, and Twiztid, Paranormal will also deliver some of the best collaborations yet from Prozak. With Paranormal due for release on 4/24, Strange Music has officially made the album available through exclusive pre-order. Like many pre-order offers in the past, Prozak fans who pre-order Paranormal will receive an autographed copy of the album, an exclusive Paranormal t-shirt (XL only), a full color sticker, and a free bonus download of “Last Will And Testament” – not available anywhere else! Following the release of “Million Miles Away”, fans couldn’t pre-order Paranormal fast enough. Having already explored the unknown, Prozak looks to take his music to the darkest place yet – reality. Will you be pre-ordering Paranormal? What’s your favorite thing about Strange Music pre-orders?